1283-16Dragonfly - 1 Light Pendant, Antique Brass,..
Ready for a Tiffany Pendant? Tiffany Pendants hang from the ceiling using a 1m chain, it's strong and stylish. When you purchase a Tiffany pendant with Lumination you got the shade and the 1m chain in which you use to hang the shade from your ceiling to add an extra touch of beauty. 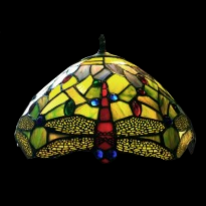 The creation of a tiffany product involves dying (colouring) glass panes and cutting them into pieces which are then placed together like a mosaic using rubber glue to give a long and lasting fitting, once done they are heated and quality assured. If you have any issues please contact us by either emailing or using the chat.